Gamecocks were not uncommon aboard ships of the Napoleonic war period. 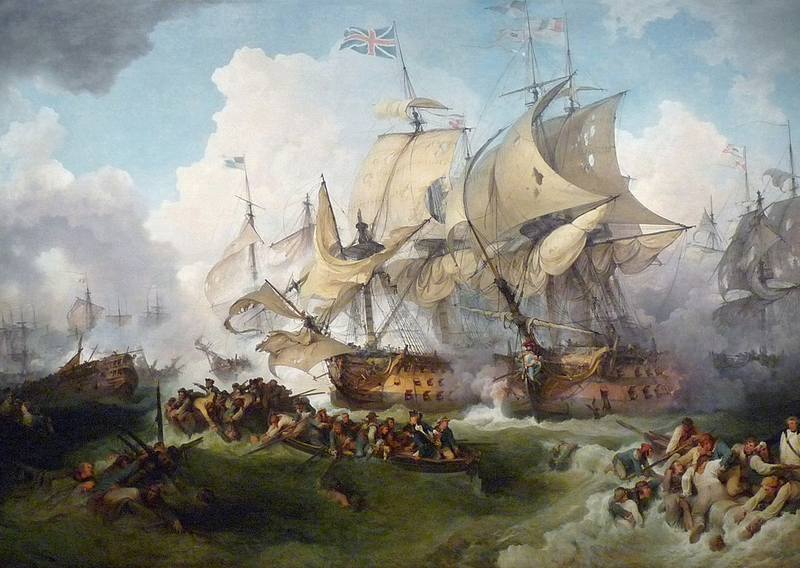 An interesting event occurred on board the Marlborough during the battle of The Glorious First of June (1794). The Marlborough (Captain George Berkeley) was part of Lord Howe’s victorious fleet, and the incident is related in “The Life of Richard Earl Howe, K.G”. by Sir John Barrow (London, 1838). “A curious incident is said to have occurred aboard this ship. When she was entirely dismasted, and otherwise disabled, by the extreme severity of the conflict,- the captain (the Hon. G. Berkley), and the second-lieutenant (Sir Michael Seymour), severely wounded, the latter having his arm shot off, and the ship so roughly treated, that a whisper of surrender was said to have been uttered, which Lieutenant Monckton overhearing, resolutely exclaimed, “he would be d---d if she should ever surrender, and that he would nail her colours to the stump of the mast”. We are grateful to Roy and Lesley Adkins (authors of “Jack Tar”) for providing us with this reference.